Lionel Atwill and Fay Wray star in a Noirish horror film from Michael Curtiz. WB USA R1 DVD. Ivan Igor (Lionel Atwill) is a wax sculptor who runs a small museum in London, his work is critically acclaimed but fails to attract the crowds who are drawn to rival wax works showing gory horrors. Igor's business partner decides the only way to recoup his money is to burn down the museum for its insurance value, Igor tries to stop him but ends up getting stuck inside the raging infero. A decade later in New York, a badly crippled Igor is opening a new museum of wax works, but his arrival co-incides with several mysterious disappearances from the city morgue that pique the interest of newspaper reporter Florence Dempsey. 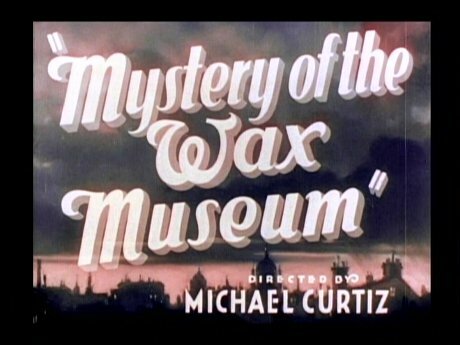 Although billed as a horror film, Mystery of the Wax Museum is more of a crime/mystery film, emphasised by the contemporary city setting and the fact that the main character is a newspaper reporter - the only real horror comes from the presence of a deformed creature and the story never crosses into supernatural territory, indeed a key rule of horror films is breached in that none of the deaths are shown on-screen. Characterisation is not bad and there is some good mystery built up as well as some tension in the later scenes and at just 70 minutes the film moves along at a fair pace throughout with some clever quick-fire dialogue, although the epilogue ending just seems a little odd. Narrowly pre-dating the introduction of the Hayes Code the script is able to contain a junkie character although it does not delve into the darker territory of Warner's earlier horrors such as Doctor X (1932). On the production side, the film is very well served. Filmed in the early two-negative Technicolor process (and believed to be the last film shot in this format) it has a wondeful pastel hue throughout. The elaborate sets all look very impressive as do the wax works - although these had to be played by real people due to the hot lights required by the colour film, a lot of effort has gone into making them look realistic and they never obviously move or breath on camera unlike in many other films. The early signs of what would become the Film Noir style are obvious in Michael Curtiz's direction - one of the first shots in the film employs a Noir trademark dutch angle close-up. Where the film does suffer is in the music department - many early sound films did not have a backing soundtrack, a combination of the technical difficulties of mixing sound levels and a fear that audiences would become confused by having sounds that were not really present, the result being that many tense or dramatic scenes that could have used some music to enhance, instead play out in silence and lack some of their potential impact. British actor Lionel Atwill is best remembered today for his supporting roles in Universal Horror pictures, but the early 1930s saw him taking a number of leading roles and he gives a good showing here. The first 'scream queen' Fay Wray gets a typically demur-character-in-danger part here, but plays it well and is joined by ganster film regular Glenda Farrell in a typically fast talking journalist part (a role she would define in the later Torchy Blane series). More crime than horror, Mystery of the Wax Museum is still a film worth watching thanks to a decent script, solid acting and some impressive directing. Recommended to fans of the classic film era. Directed by anyone interesting? Michael Curtiz - born in Austria-Hungary he worked extensively for Warner Brothers in the 1940s, producing a number of iconic films including The Adventures of Robin Hood (1938) and Casablanca (1942). Who is it for? Recommended to classic cinema fans. The film looks generally good, there is some noticable damage at the reel ends but certainly always watchable. Audio English mono - some background hiss but otherwise very good for the era. Availability Only available in a double-bill pack with the very similar remake House of Wax (1953) on a dual-sided disc. Other regions? European R2 releases includes different language options. Strongly directed, well written and with some good acting this film comes recommended to classic cinema fans. Considering that the film was considered lost until the 1960s, this is a very good looking and sounding print. All text in this review written by Timothy Young - Hallowe'en - 31st October 2010.